Information about the Charts in Preview mode feature has been removed. This feature was previously shipped to understand how users would like to interact with Charts. Based on user insights, we’ve decided to roll it back and work on an overall improved experience. We’ll keep you updated once we have further developments. Recently we announced that Sway now allows shared editing and same-time collaboration, so you can work together to easily bring your ideas to life in an interactive way with friends, family and coworkers. 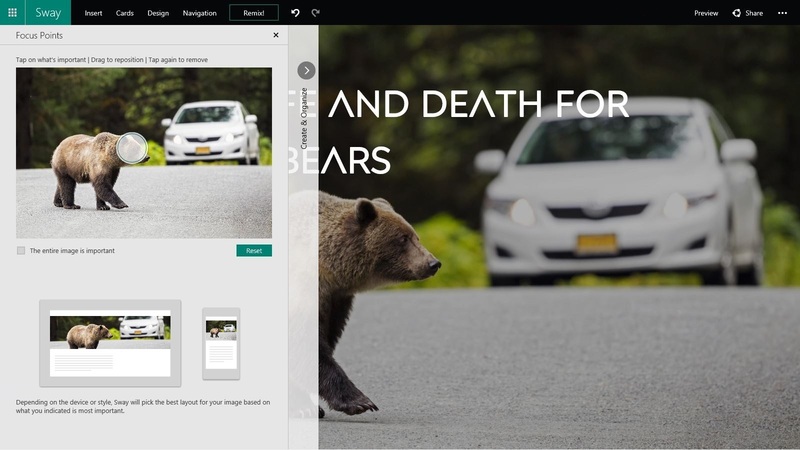 Enabling collaboration in Sway was a top requested feature in our feedback forums, and it was a big step in our journey with Sway Preview—a journey which we’re continuing with more updates to announce today! There’s a lot going on behind the scenes when you drag and drop a picture into Sway, especially if it’s being stylized as a background image for a heading or title. Sway automatically crops your image by evaluating it and picking out what’s important, like your family’s faces or the horizon line in your beach photo, while also considering how to make the image fit the screen size and match the particular style you chose. 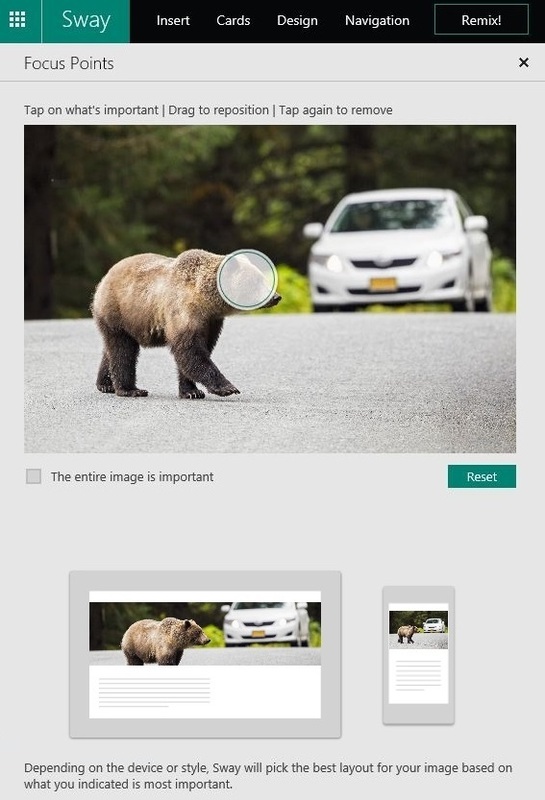 While we continue to improve Sway’s intelligence, we know Sway doesn’t always get the cropping right. (For example, Sway doesn’t know which person accidentally photo-bombed your family photo.) Because of this, we’re adding the ability for you to express more intent to Sway on what’s most important in your images, to help ensure you end up with cropping you like. By using Focus Points in Sway, it’s easy to tell Sway what to focus on in your image with just a couple of taps or clicks. Whether you’re in the Storyline or the Sway Canvas, tap or click the image and select Focus Points in the toolbar or the buttons that appear. When the Focus Points pane opens, just tap or click on what’s important in your image! You can also move Focus Points around by dragging them, or remove them by tapping or clicking them again. And at the bottom of the pane, you can see a preview of how the resulting crop could look on tablet/PC screens and mobile screens. If you don’t want the image to be cropped at all, just select The entire image is important checkbox. This can keep you from losing important things, like text in the image or your company’s logo. It’s easy to use Focus Points to tell Sway what parts of your image are important and ensure they’re always included in the cropping. Sway remembers your Focus Point choices for your image even if you move it around, make it a background image for a heading, Remix! your creation’s style or layout, or view it on a different device. Sway will continue to adapt the cropping across device sizes, but don’t worry—the parts of your image you said were important will always be included. Now, you might be wondering: why doesn’t Sway just have crop handles and let me manually specify exactly how to crop the image? Well, because Sway continuously adapts the formatting to make sure your creation looks great on any screen, manual image cropping isn’t as intuitive as it seems. If you crop a picture, you very specifically set the dimensions. But what would this mean when you hit Remix!, change the style or layout, or view your Sway on a different device? It would mean Sway wouldn’t be as flexible to adapt your design to look great on any screen. We may eventually add manual cropping as an override, but for now, Focus Points lets you get the image cropping you intend while still letting the magic of Sway make your creation look great. 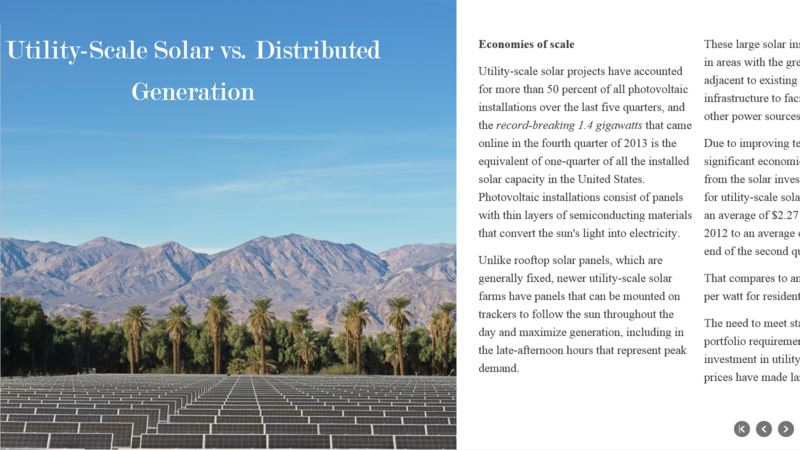 Read more about these interesting challenges in this companion blog post. For a while now, we’ve had Emphasis as the sole way to differentiate text in your Sways. The idea behind Emphasis is that you use it to ask Sway to change the selected text by making it more noticeable, typically from a distance. Therefore, depending on the style you are using, Emphasis will cause text or headings to be bold, underlined, colored, highlighted, bigger, brighter, more animated, etc. 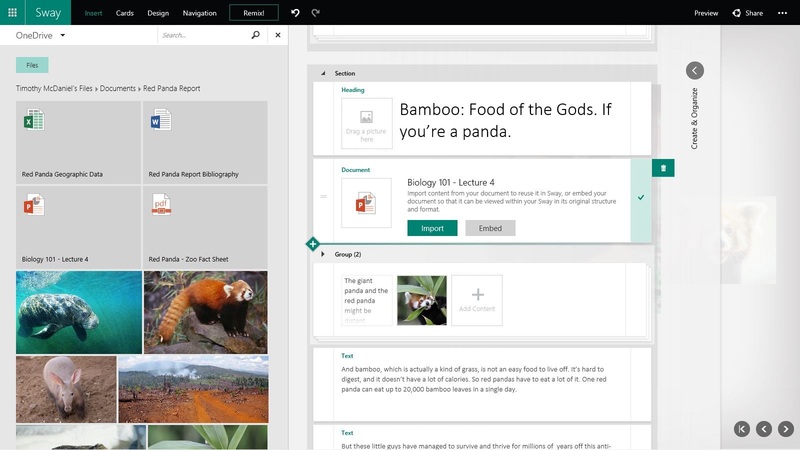 Now we’ve added Accent—an additional way to differentiate content in your Sway. Accent allows you to express your intent by telling Sway to be more subtle. With Accent, you can make a piece of content look different from its surroundings, while retaining the same visual impact level and layout. 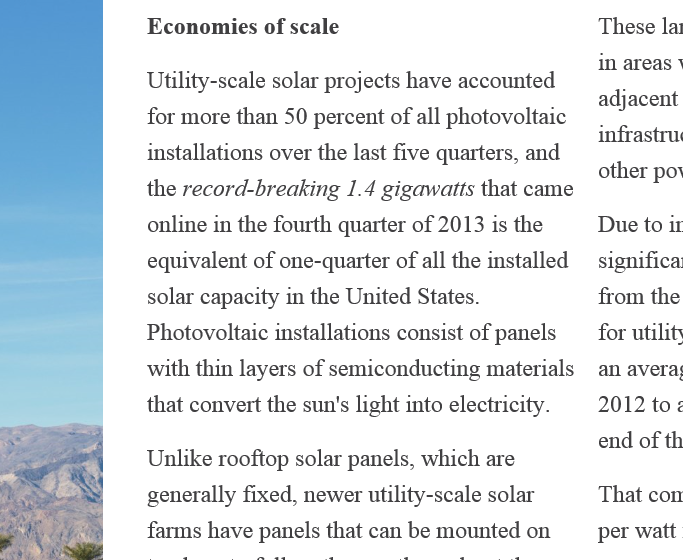 So changes to accented content are more refined, such as italics, soft glows, drop shadows, or saturation. At the moment, Accent can only be applied to text, and its effect in all styles will be italic formatting, but longer term Accent will be available for all content types and may apply different subtle changes depending on the style. So you can think of using Emphasis for content you want the reader view as key, such as your thesis or an important quote. Use Accent when you want to subtly differentiate something from its surroundings, such as which children in the class received honors or a word that is in a foreign language. To use Accent, simply select some text then tap or click Accent in the toolbar. To use Accent, select the desired text then tap or click Accent in the toolbar. Accent makes content look subtly different from its surroundings, while retaining the same visual impact level and layout. In January, we announced support for adding your content from popular third-party sites via embed codes, and we’ve been expanding the list of supported sites since then. In addition to other types of content, this has meant you can embed in your Sway a Word, Excel, PowerPoint or PDF document that is stored on your OneDrive. That way, anybody viewing your Sway can scroll the pages of your Word document, filter the charts and tables or your Excel spreadsheet, or flip through slides of your PowerPoint presentation. 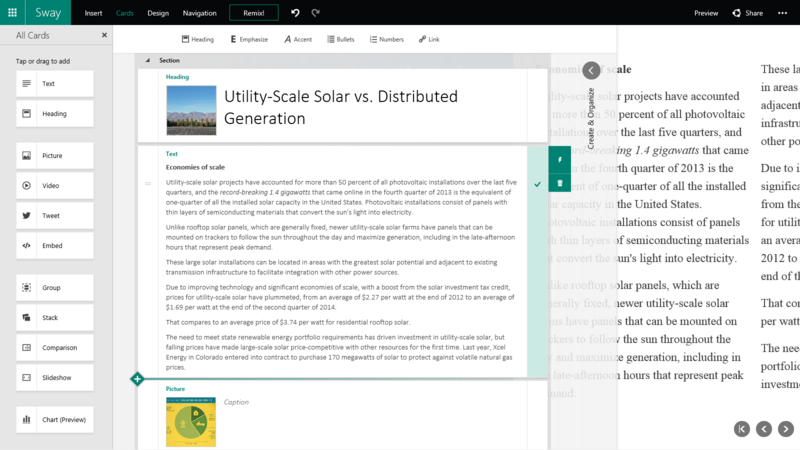 In other words, embeds preserve the original formatting and layout of your documents, and including them in Sway lets you display them along with other multimedia. While many people are used to seeing this type of embedded content across the web, not everybody is familiar with creating the embed codes for the content they’d like to include in their Sway—including embeds for Office documents. Of course, you can still choose to manually create embed codes in Word, PowerPoint, and Excel Online (for documents you’ve uploaded and stored in your OneDrive). Generate the embed code from File tab (Share option) and then copy the code to an “Embed” Card in your Sway. A few weeks ago, we released a major update to Sway for iPhone. In that update we added a number of capabilities such as Emphasis for text, bullets and numbering, support for video and more. With those changes, Sway for iPhone users could more easily create polished, interactive content on the go (this video shows those updates in action). 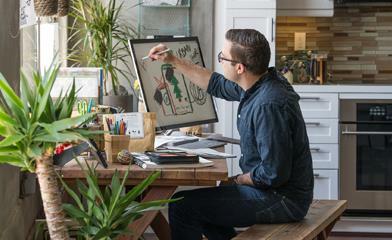 Improved sign in experience—It’s easier to get going with Sway for iPhone. If you’re already signed in to Word, Excel, PowerPoint or OneNote on your iPhone, Sway will automatically log you in. You can go from launching the app for the first time to making and editing Sways in seconds! Improved accessibility—With Sway for iPhone v1.3, we have better support for reading and editing using Apple VoiceOver. Bug fixes—We continue to respond to your feedback by fixing bugs and improving app performance. For example, we made the image upload process more stable.